Women with dark elbows often spend a lot of money on commercial products but usually don't get the desired results. However, here we have some best natural tips to get rid of dark elbows and get back fairer elbows. Lemon is a natural bleaching agent and helps a lot to whiten dark elbows. Honey deeply moisturizes the skin preventing darkening of the skin. Take the juice of one lemon and mix it with one tablespoon of honey. Apply the mixture of lemon and honey on the affected areas and massage at least for 3-5 minutes. Leave the mixture at least 15-20 minutes and finally rinse off with lukewarm water. A mixture of Baking soda and milk is very effective in cleaning the skin and reduces darkening of the skin. Take one tablespoon of baking soda and mix it with milk enough milk to make a thick paste. Apply this paste on elbows and scrub it using circular motion for 3-5 minutes and then wash off with fresh water. Papaya contains a skin cleansing enzyme called papain and various vitamins that helps to whiten dark elbows. Take one slice of papaya and rub it to your skin. The nutrients contained in papaya will lighten your elbows and make your skin fairer. Application of Cocoa Butter or Shea Butter is very effective to get soft and glowing skin caused by dry and flaky skin. For best results apply cocoa butter or Shea butter on the dark elbows every night before going to bed. Aloe Vera is very effective in reducing the sun damage caused to the skin due to overexposure of the elbows to the sun. It also moisturizes the skin and prevents the dryness which may lead to darkening of the skin. Take fresh leaves of Aloe Vera and take out the gel by breaking the fleshy leaf. Apply the fresh aloe vera gel on dark elbows and leave it for 20-30 minutes to lighten dark elbows. Sandalwood and turmeric are being widely used for skin care since ancient time because of their ability to make skin glow. Take turmeric and gram flour in equal quantities and add some rose water to make a thick paste. Massage this paste to your dark elbows at least for 20 minutes. A mixture of Gram Flour and Lime juice is also considered very effective to lighten dark elbows. Gram flour can cleanse the area and also provides mild exfoliation. Lime juice is a natural bleach and this will help to reduce the darkness. Take some gram flour and add some lime juice to make it damp. Apply the mixture and rub in circular motion at least for 5 minutes and then allow it to dry and wash it off to get rid of dark elbows. A mixture of vinegar and yogurt has been shown excellent results in getting rid of dark elbows. Apply a mixture of vinegar and yoghurt on the affected areas and leave it to dry. When the mixture becomes dry rub the area in circular motion for 2-3 minutes and then finally wash off with fresh water. Mix one teaspoon of coconut oil with 1/2 teaspoon of lemon juice and rub this natural whitening solution onto your dark elbows and leave it there at least for 15 - 20 minutes then wash off. Turmeric has antiseptic properties and milk act as bleach. Honey deeply moisturizes the dry skin and also has antiseptic properties. These natural properties of the ingredients will definitely help to get rid of dark elbows. Take 1/4 teaspoon of turmeric, 1/4 honey and 1/2 teaspoon of milk. Mix all the ingredients and apply on dark elbows at least for 15-20 minutes. Cucumber is a great source of natural moisture and has skin cleansing acids that help in removing impurities from skin. Take fresh slices of cucumber and rub it over your dark skin for 15 minutes. 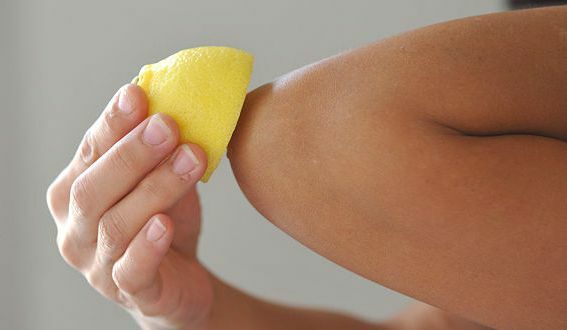 Alternatively a mixture of cucumber pulp and lemon juice also helps a lot to lighten dark elbows. Exfoliation of dead skin cells is essential to get fairer elbows. A mixture of sugar and olive oil acts as excellent scrub to remove dark dead skin cells. The sugar present in this home remedy work as exfoliate and the olive oil will moisturize the skin. Mix equal quantities of olive oil and sugar to make a thick paste. Apply this mixture on dark elbows. Rub the skin using this mixture at least for 5 minutes. Finally wash off using fresh water. Mix 1 tablespoon of gram flour with enough curd to make a thick paste. Apply this on your dark elbows. Leave for about 15-20 minutes or till it dries up. Now using your fingers, rub in circular motion for about 5-7 minutes and finally wash off with fresh water. Take 4-5 almonds and make a coarsely powder. Mix this coarsely powder with 1 tablespoon of yogurt. Apply on dark elbow. Leave for 15 minutes or till it dries up. Rub gently with wet fingers. Scrub in circular motion. and finally wash off with water. For best results repeat this twice per week.